“Happy New year everyone! We hope you had a great festive season and are ready for many exciting moments that no doubt lie ahead in 2016. 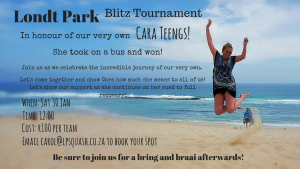 We start this year off with a Blitz Tournament in honour of our very own, Cara Teengs. Most of you will remember that Cara was involved in a terrible bus accident when returning home following a squash tournament she managed in July 2015. Dense bushes stopped the bus from rolling further down the embankment. Ongoing therapy is helping her from the stroke she suffered. Check out more about the accident and her recovery by clicking on the following link: https://www.youtube.com/watch?v=56a7LcB5IJ8&feature=youtu.be. As you can see, she has come a long way since that dreaded day but she still has a long road to recovery ahead of her. 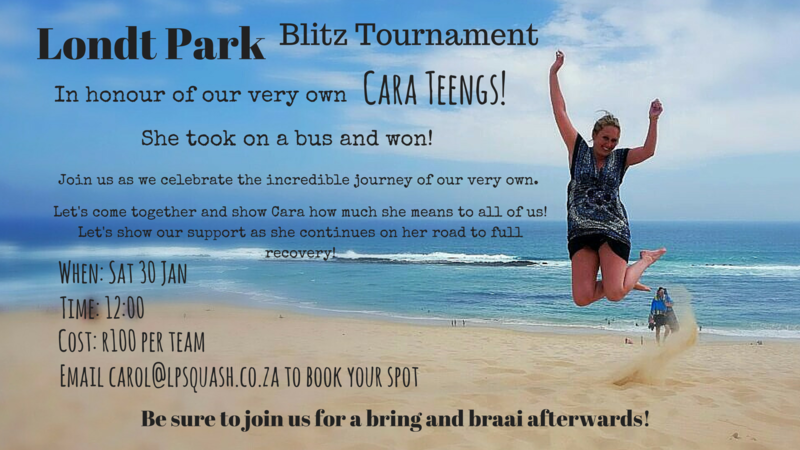 This Blitz tournament will be held in Cara’s honour; funds raised will go towards her ongoing expenses. We have also gained a pretty awesome sponsor from Cell C, this was made possible by the incredible Mr Brett Cousins. His generous contribution is greatly appreciated; it is evident that he has not forgotten his roots 😉 . Cell C’s rather appropriate logo: Believe, with the ‘C’ watermark is pretty fitting. Cara, on a daily basis, without knowing, you give so many hope and inspiration to BELIEVE that overcoming anything is possible – thank you. We look forward to seeing you all there on Saturday 30 January; we have some pretty awesome Cell C merchandise to raffle off, so be sure to bring some extra moola!